Sipping rum from a decades-old bottle might be one of our closest analogs to time travel. Visit Havana in 1958 by way of light, sweet, 40-year-aged house rum bottled that year for the legendary Sloppy Joe’s Bar, where Ernest Hemingway used to drink. Or let the molasses flavor with faint fruit, spice, and herb notes of a 15-year Jamaican J. Wray & Nephew—even more intriguing for its 17-year-old brother’s credit in the creation myth of the Mai Tai cocktail—take you to Oakland, California, circa 1944, and the original Trader Vic’s faux island fantasy of palm trees, wooden face masks, and canoe-sized cocktails. Amid a broader infatuation with ancient spirits, defunct rums are staging a comeback, thanks to a boom in tiki culture that spotlights cocktails mixed with all-but-extinct styles and intrepid distillers looking to replicate pre-World War rums. Sleuths like Remsberg and Alex Bachman, proprietor of Chicago-based rare spirits broker Sole Agent, hold the secret to this quaffable time travel—though it requires considerable funds or, in Remsberg’s case, an invitation. His three-year-old brokerage is one of a handful of purveyors connecting bars like Canon in Seattle, Chicago’s Milk Room, and Martin Cate’s venerable San Francisco tiki outpost Smuggler’s Cove to such dusties as World War II-era French Amer Picon, single-cask Karuizawa Japanese whiskey, and—of course!—1960s St. James rhum agricole from Martinique, or 1940s British Royal Navy rums, all sourced from estate sales, boarded-up restaurants, and private collections worldwide. Remsberg in his wonderland. Photo by Ben Schaffer. It’s no wonder that Bachman’s nickname as the “Indiana Jones” of vintage spirits caught on among the Chicago media who’ve covered Sole Agent. As a longtime bartender with a background in wine, Bachman possessed a fascination with vintage spirits that originated with amaro, given its ageability and indoctrination in terroir. Working alongside Chicago restaurateur Matthias Merges to open spots like (now-shuttered) izakaya Yusho, which amassed a sizeable fernet inventory, and cocktail bar Billy Sunday, known for its amari collection, Bachman realized that drinkers were thirsty for that old juice, too. He started Sole Agent in 2015 with about 40 wholesale clients—and now has nearly 300. He’s quick to point out that his approach to sourcing is far more streamlined than we romantics like to imagine, relying largely on a tight network of trusted contacts rather than pounding the pavement in a felt hat. Typically, the process starts with an email from one of said vendors—roughly 95 percent of whom are based in Italy, Portugal, or Spain—with a photo displaying bottles uncovered, say, at an estate sale or a shuttered warehouse or restaurant. After pricing is determined and enough bottles are amassed to achieve cost-effective shipping, the booze sets sail on the one-month trip from Livorno, Italy, to Newark, New Jersey. After passing customs, the bottles are transported to a temperature-controlled storage facility in Barrington, Illinois, and are then dispensed as needed to Sole Agent’s Chicago office and the hotels, bars, and restaurants in the seven U.S. markets it reaches. 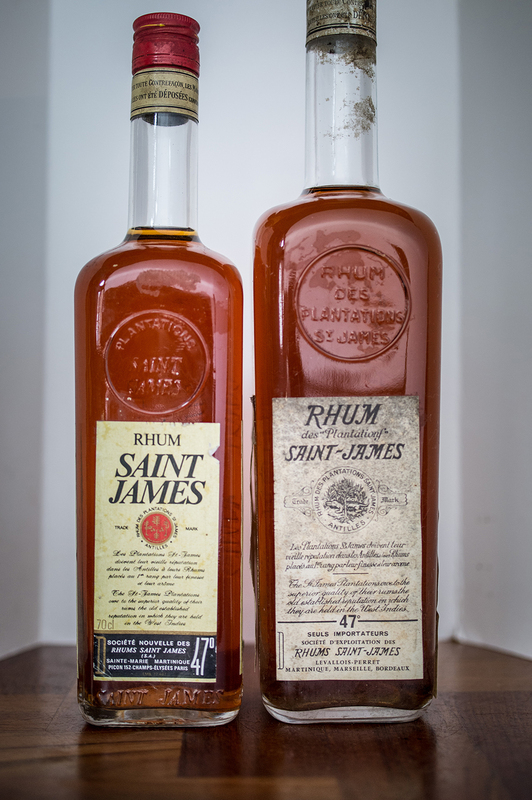 But what exactly was the culprit that nearly killed all those complexly flavored, mahogany-hued Jamaican, Guyanese, and rhum agricole styles that so many are clamoring for today? 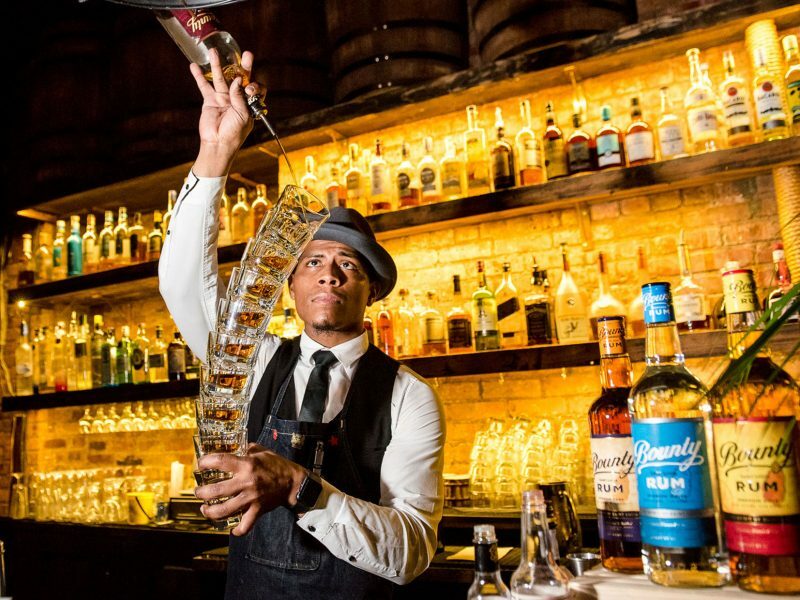 He’s referring to the rise, mid-twentieth century, of flavorless spirits such as vodka—and later, white rums—that appealed to consumers who were more interested in deriving taste from mixers than from a spirit’s own inherent character. Smirnoff’s 1950s “Leave you breathless” campaign kicked off a decades-long love affair with vodka that helped shift Bacardi’s purview from floral rums to the flavorless white and “spiced” rums spiked with sugar and spices and destined to be downed with Coke. 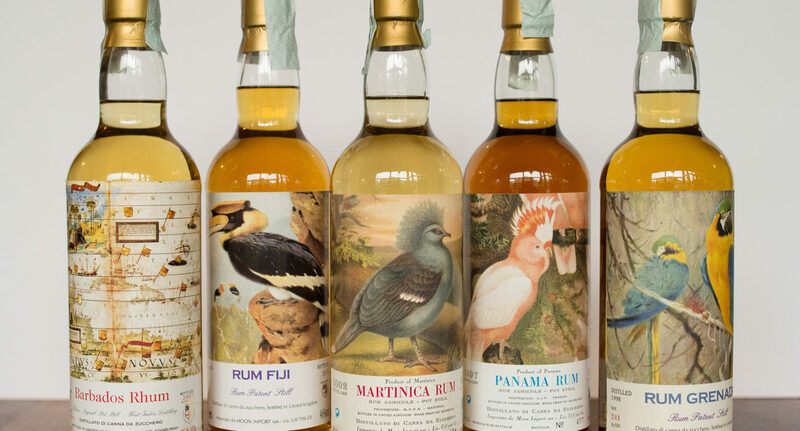 “Consolidation across the wider spirits market in the 1970s and ’80s—coupled with shrinking demand—made it no longer viable to keep many of these rum and whiskey distilleries running,” Bachman adds. It was right around this time that a young Remsberg was falling hard for these old styles. His relationship with rum began like that of many, however—drinking it in cheap mixed drinks as a college student. That his watering holes of choice were the famed tiki bar Trader Vic’s and Chicago’s bygone Don the Beachcomber proved in no small part responsible for his later obsession. Poring over the pages of Trader Vic Bergeron’s 1946 Book of Food & Drink and the 1972 Bartender’s Guide revealed to Remsberg that many of the cocktails inside were nearly identical in fruit and syrup combinations; the big difference was the style of rum. And so the collecting began. On Remsberg’s frequent work trips to Europe and the Caribbean, he always tried to set aside time to prospect in wine shops or pubs. He supplemented that with vacations to Jamaica and Barbados, where he’d scour broken-down grocery stores or rum shops down old country roads. The rise of the Internet changed all that, of course, as rum nerd forums and chat rooms made tracking down bottles easier, both abroad and in the States. By far the biggest game-changer for Remsberg, though, was eBay. “People would always give my father bottles of bourbon for his birthday, but he wasn’t much of a drinker, and I remember [after] he passed moving a number of those bottles out and bringing them wherever I was living,” he says. “Then here’s eBay, and I’m wondering if anybody’s putting Grandpa’s stash up for sale, and damned if they weren’t. 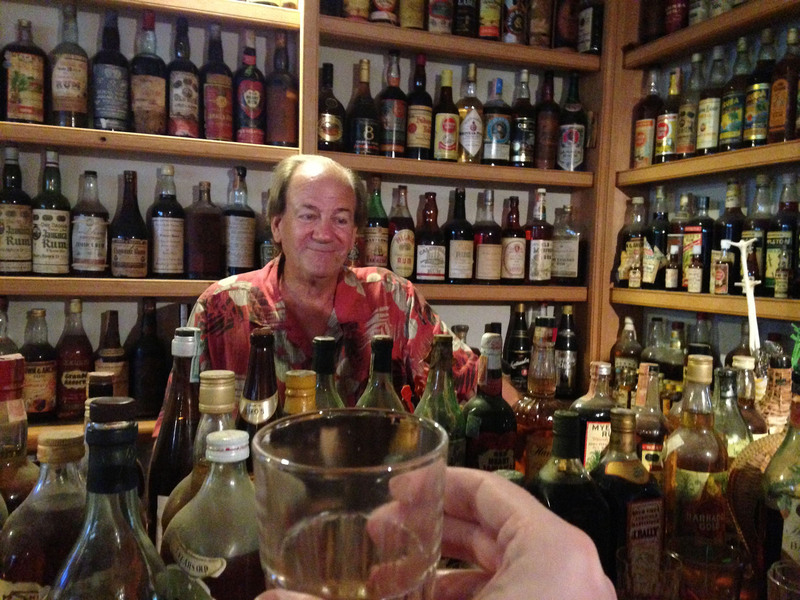 So I was one of the first guys to buy old liquor bottles on eBay, and I bought hundreds,” he says. Upwards of 400, by his estimate, including the entire rum collection of a Vanderbilt family heir. Beyond nabbing prized bottles from numerous grandpas’ attics and markets with little or no distribution on the e-commerce hub, he acquired old price lists from duty-free shops and grocery catalogues dating back to the nineteenth century, which helped him put many bottles into historical and monetary context. That was until 2012, when eBay banned its informal marketplace for collectable spirits following accusations that it was being used to illegally sell to minors. “They shut down my marketplace,” Remsberg says. 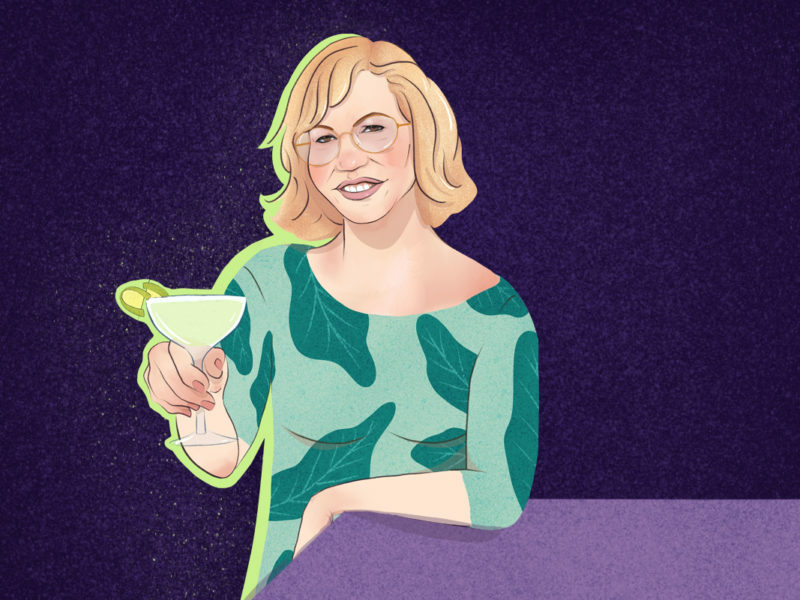 Since then, bartenders have been busy turning the non-collectors among us on to not just the romance but also the gorgeous drinkability of these old relics, both alone and in revived classic cocktails. Still, there are only so many Smuggler’s Coves and Lost Lakes (Paul McGee’s hipster tiki bar in Chicago) willing to invest in the vast inventories or vintage collections to support such tastes. If the massive growth of online booze forums and exchanges is any indication, the real future of vintage spirits, per Bachman, is in bringing them directly to the consumer. He aims to open a boutique retail shop in Chicago next year alongside a robust e-commerce platform that will ship to all 50 states. Most spirits will fetch $85 to $100 apiece, with a handful of rarer bottles broaching the thousands. “The education piece is going to be essential,” he says. “People want to know the history behind these special bottles.” Once again, his main obstacle isn’t tracking down bottles, but navigating the convoluted patchwork of state regulations for online liquor sales. Remsberg, on the other hand, isn’t collecting as much these days, nor may his New Orleans vault be long for this world. At a private dinner during Tales of the Cocktail in July, Alexandre Gabriel of Maison Ferrand announced that he is in discussions to acquire Remsberg’s extensive collection for the proposed Ferrand Plantation Foundation. Plantation owner Maison Ferrand recently purchased the Château de Roissac, an eighteenth-century estate near the brand’s headquarters in Charentes, France, and plans to convert it to a facility dedicated to rum research, education, and preservation. In the meantime, Remsberg continues his detective work. You’ll often find him with fellow rum obsessives like Jeff “Beachbum” Berry (who owns French Quarter tiki bar Beachbum Berry’s Latitude 29), huddled over a few bottles and hand-scrawled recipes recovered from L.A.’s original Don the Beachcomber, as they attempt to match juice to recipes like the Sherlock Holmes and John Watson of rum. And he may finally crack some of those yet-untasted single bottles without exposing said liquid to the elements. “One of my daughters is a veterinarian; maybe I’ll have her bring me a horse syringe and hypodermic needle to extract rum from those corked bottles,” he muses. I ask if he’s heard of a Coravin, the pricey device with a similar function beloved by the wine world. “Do you know where to get one of those?” he asks. Looks like I’ve found my ticket to Remsberg Manor, if I can get there in time.